Concordia undergraduate students might be paying less for health and dental insurance starting next fall, thanks to a new insurance plan. The Concordia Student Union is looking at proposals from six insurance companies. “At this point, we do expect to have a very similar plan with very similar coverage but at a lower cost to students,” said CSU Finance Coordinator Thomas David-Bashore. The six proposals submitted include one from their current provider, Alliance étudiante pour la santé au Québec. They asked that all companies submit quotes for the same coverage that students have now. David-Bashore couldn’t say the exact amount that students will save until a plan is chosen, but he estimates their savings at around five per cent in annual costs per student. Changes to the insurance plan would start in the fall semester, on Sept. 1. Regardless of any changes made to the plan, students would still have the option to opt out. Their request for proposal was posted on their website and sent out to brokers on Feb. 1. All the companies’ proposals have been under review since Feb. 28. A CSU committee will then choose one of these proposals and make a recommendation to their council on April 12. This process is being done now because their five-year contract with ASEQ is ending. David-Bashore believes that the contract had been up for renewal once before since 2009, but the executive at the time decided to renew the contract, as opposed to looking for other options. David-Bashore says the last time the CSU did a request for proposals was some time between 2007 and 2009. He says if there was one, no one kept records of it and it was not made public. “We wanted to be really careful since it’s been such a long time to have a very comprehensive process,” David-Bashore explained. On last year’s election ballot, the CSU proposed an increase on the annual cap for the health and dental insurance plan, raising it incrementally from $195 to $225. At the time, the CSU said this increase would allow for better mental health services for students. David-Bashore explained that while the increase passed, he does not see the new contract costing more than the current insurance plan. At this point, he said, none of the bidders have submitted a contract as high as $225. He emphasized that students will still have access to mental health coverage. “Right now, students have access to mental health coverage through ASEQ […] At this point we’re looking at similar mental health coverage. That’s something that’s very important to the committee that’s looking at these plans—and very important to me personally,” he explained. The committee is looking at taking three-year contracts, with the possibility of a two-year extension, should the council decide at that time that it’s best to stay with the same company. While the council has kept most of the process public, once they receive the proposals, their contents must remain confidential. David-Bashore does however encourage students to come forward to himself or CSU General Coordinator Lucinda Marshall-Kiparissis if they have any questions or concerns about the process that they would like to address. On this year’s election ballot, the CSU is proposing a redistribution of fees levied by the CSU. The goal is to reallocate the funds to where they are needed. This will not have an effect on the fees that students are currently paying. “We’re not proposing an increase in any fee without making up for it with a decrease of another fee,” David-Bashore explained. 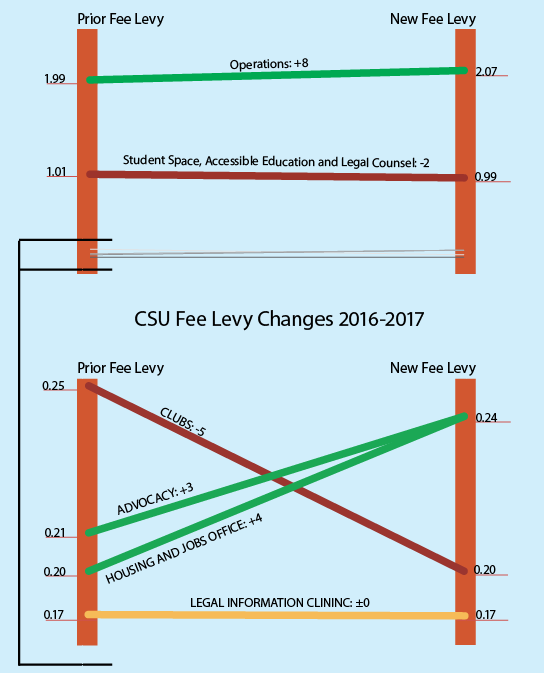 The question proposes a decrease in CSU clubs of six cents per credit, as well as a decrease in the Student Space, Accessible Education and Legal Counsel—SSAELC fund—fee of four cents per credit. This will allow for funding increases for CSU operating fees, the Housing and Jobs Office, and the Advocacy Centre. David-Bashore explained that the current clubs budget has a projected surplus of nearly $90 000. He said that the clubs weren’t using or planning to use these funds. With the proposed redistribution, clubs still have a projected surplus, which will likely allow for additional clubs and for current ones to grow. “I do want to point out that these budget numbers are projections that I’ve made, but all of the budgets for next year will be at the discretion of next year’s finance coordinator,” David-Bashore said. He emphasized that the numbers presented are not set in stone. At their recent council meeting, the CSU voted to allocate an additional $22,713 from the SSAELC Fund for plumbing, electricity and general demolition of the future CSU Daycare, located at 1424 Bishop St. The SSAELC fund holds approximately $9 million. At that meeting, Marshall-Kiparissis said that their general manager had emailed her with a document detailing the unexpected costs. “Demolishing and working on old buildings always incurs risks of unanticipated work and there was indeed unanticipated work in terms of the state of the future daycare,” Kiparissis detailed at the meeting. In December 2016, the CSU voted to allocate a maximum budget of $63,870 from the SSAELC fund for the demolition, in case unexpected costs arise. They initially expected the demolition to require $55,000, but added the extra $8,000 to absorb any unexpected costs.